The most commonly sold genus of stony coral in our interest from the ancient past to present, Gonioporas are notoriously poor-survivors... EACH polyp must need be fed... meaty foods, of size.... every few days... Try other species! Close up of a Goniopora... count those tentacles... 24? Goniopora columna Dana 1846. Colonies as tufts on short columns. 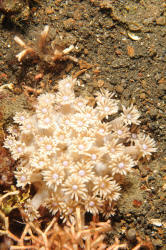 Corallites vary depending on position. Ones toward the center of colonies have fine columella and septa; those on the side more robust structures. 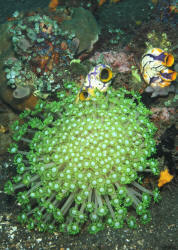 Polyps have large central cones. Indo-Western Pacific. Queensland close-up and Red Sea images. Goniopora lobata Milne-Edwards and Haime 1860. Colonies as columns with growth. Large (more than 5mm.) 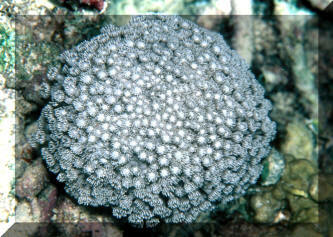 corallites with small columellae and oral cones; elongate in appearance on full extension. 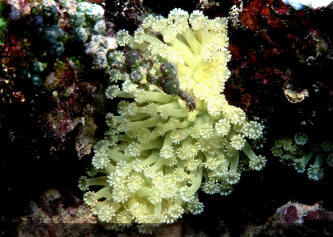 Tentacles and oral cones typically white in color; contrasting with polyps which are otherwise brown, tan or green. 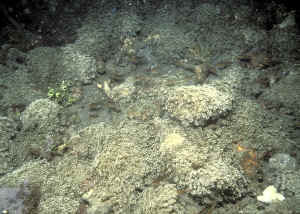 Right and below left in Queensland, Austr., broken and whole colonies in the Red Sea. Goniopora tenuidens (Quelch 1886). Colonies as hemispheres or ovals. 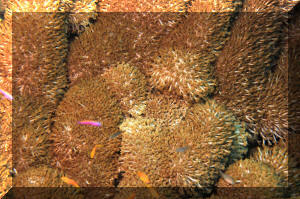 Polyps packed tightly together, tentacles of all the same length. Occurs in blue (looks pink in photography at times), tan, brown. Below, in Cebu, P.I., and two images in Queensland, Australia.